When President-elect Barack Obama will take office as the 44th president, he will be facing historic challenges, including a near catastrophic collapse of the economy, two wars, and a much-maligned image abroad. In November 2008, the Government Accountability Office released a list of 13 urgent issues the incoming administration needs to address during its first year, including food safety and the 2010 Census. But a week before the inauguration, PR pros overwhelmingly said that the economy is the first public affairs issue the incoming administration must address. “His first, second, and third issue is going to be our economy,” says Douglas Pinkham, president of the Public Affairs Council. At press time, the transitional Obama government was trying to get a fiscal stimulus package through Congress. “One of his strengths is [his ability] to communicate,” says Robert Mathias, MD at Ogilvy PR Worldwide in Washington. He points to the failed semantics game when the first round of government monetary support was universally dubbed a “bailout,” while the new solution is referred to as a “stimulus.” In fact, a number of public affairs pros remarked not only on Obama's oratory skills, but also on his delivery. 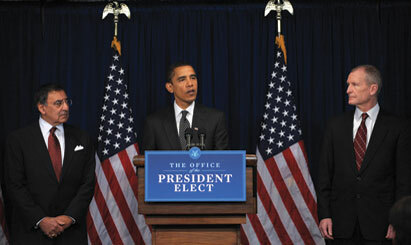 In addition to upholding its promise of greater transparency, the administration is likely to communicate the importance of “shared responsibility” in this economic crisis, he adds, while at the same time issuing a “much wider call for the public to weigh in.” A glimpse of that agenda is on display at Change.gov, where the administration recently added a “citizen's briefing book,” in which the public can weigh in with ideas on issues like healthcare. “The thing that is essential to the American democratic process is we're a nation of ‘individual effect,'” Mathias says. “To have voters with you or to get them to turn against you, it's all about how you explain things... of how they affect you,” the individual. “As people feel included, I think the public [is] going to be behind the president-elect,” adds Josh Gottheimer, EVP and global chair of corporate and public affairs at Burson-Marsteller. He also notes that on a global scale, Obama will have to “immediately engage the rest of the world,” as a demonstration that he doesn't expect to “go it alone” on foreign policy. Some of Obama's success comes from an ability to engage groups that don't always agree with him and include them in the process. For example, he is reaching out to “all the major industry sectors” on the stimulus package, and “having that broad support is what's bringing confidence” in it, Dhillon says. He's also kept on some of President Bush's previous appointments, like Secretary of Defense Robert Gates, which helps foster a sense of “inclusion” to previous non-supporters.